SCVHistory.com CP1705 | Wm. S. Hart Park | Reckless Driving Gets 'Benched' at Hart Park. Reckless Driving Gets 'Benched' at Hart Park. Friends of William S. Hart Park & Museum | October 2017. Enter William S. Hart Park through the pedestrian gate, and you'll encounter a high-backed bench with a deep-seated meaning. "After the tragic loss of a classmate and friend in a car accident this past summer and a lot of thought, I decided on building a bench that would symbolize reckless driving," writes Katie Berndt, the 17-year-old Hart High School student who created the bench as her Girl Scout Gold Award project. It was unveiled Sunday, Oct. 15, 2017. "I hope to draw more awareness to reckless driving and the effects of it," Berndt writes in her project description. "I wanted to put my bench at William S. Hart Park because I remember going to that park as a kid, having a good time playing, and seeing the animals. I also thought it was the perfect location for my project because the physical location of the park is near a street full of cars at almost any time of the day." 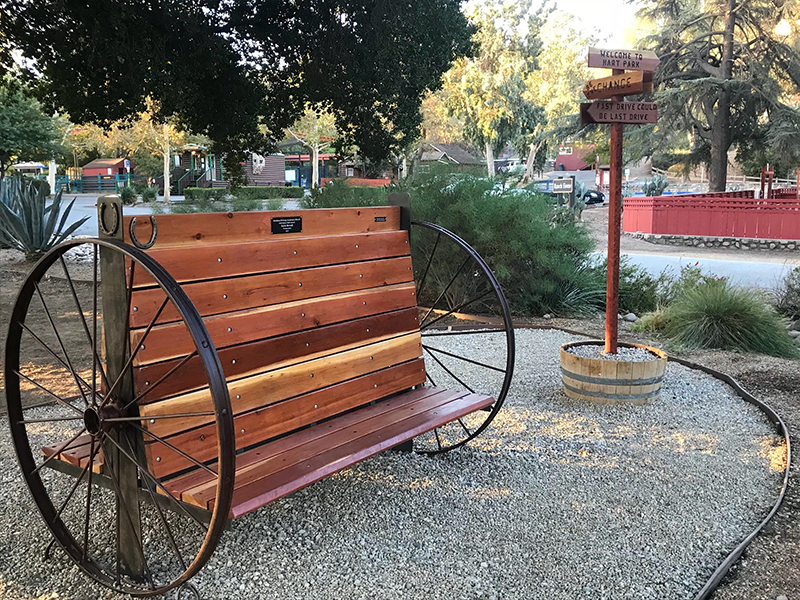 Said Hart Park Superintendent Eric Reifman: "Ms. Berndt exceeded my expectations by designing the bench to look like a western wagon with wagon wheels. To take her project one step future, she created a sign post with directional slogans that read, 'Welcome to Hart Park,' 'Be the Change,' 'Fast Drive Could Be Last Drive,' and more," Reifman said. "Her project was carefully planned out all the way to the location. The bench is next to an extremely busy roundabout in Downtown Newhall where hundreds of people drive during their daily commute. "I am grateful that she chose William S. Hart Park to be her location." "When people look at my bench," Berndt writes, "I hope they take into consideration that ... reckless driving isn't just speeding, but it is using your phone and driving, listening to music too loud, eating and driving, drinking and driving, unfocused driving, and so much more. When they read my slogans on the signs posted next to my bench, I hope they reevaluate their driving habits and strive to make this community a reckless driving accident-free valley, just as I have."